Chiffon is a lightweight, sheer fabric that's commonly used in window scarves, sheers, bed canopies and some accessories. Its name derives from the French word for cloth. Special care must be used with chiffon because it frays easily and can be difficult to work with. Chiffon is made from different types of materials and it is often dyed or printed. Durable chiffon window treatments filter light and provide limited privacy. Silk is considered to be the best material for chiffon because it surpasses other materials in richness and smoothness. Silk chiffon is often used for decor accessories, such as flowers and bows. Silk is the most delicate of chiffon fabrics and it has a tendency to tear, making it unsuitable for window treatments that are exposed to tugging and excessive sunlight. It must be preserved carefully and dry cleaned. Chiffon made from polyester or rayon is more durable than its silk counterpart. It can be washed by hand or even on a gentle cycle in a washing machine, though it must not be machine-dried. 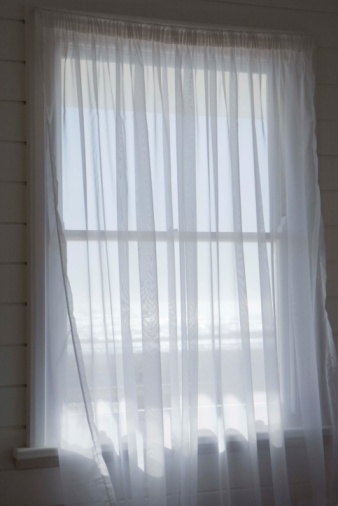 Poly-chiffon drapes as easily as silk and is considerably cheaper, making it ideal for the budget-conscious and for window treatments. Poly-chiffon does not tear as easily as silk, and stores well. Chiffon can be made up of a blend of materials to improve durability or to add elasticity. Silk and polyester are often blended together to strengthen the fabric. Blends are less expensive than silk chiffon, but they retain some of the smoothness and texture. Organza and Georgette are other fabrics used much like chiffon. All three can be made from silk or polyester and have a similar feel. However, there are subtle differences between the fabrics. Organza is stiffer and matte in appearance, while chiffon is prized for its flowing nature and shimmery texture. Georgette is thicker than chiffon and less transparent.